Are lab grown diamonds “real” diamonds? Yes! Although created in a lab, rather than dug from the earth, Ada’s lab grown diamonds are chemically and optically identical to natural diamonds. "They're both diamonds, they have the same chemical properties, the same physical properties." Since cultured diamonds are relatively rare, there are often questions about how they're made, how they're priced, and how do they stack up to the mined version. Read on for answers to commonly asked questions about stunning laboratory grown diamonds. How are lab grown diamonds produced? The process to grow diamonds in a laboratory is very similar to the geological growth process; it is one of the most precise and difficult manufacturing techniques that humans have ever achieved. It took almost 60 years of effort to develop the precision to grow gemstone quality diamonds larger than one carat! Diamonds can be produced in a lab in two ways. The first is called High Pressure-High Temperature (HPHT) and the second is called Chemical Vapor Deposition (CVD). Each process is best suited for certain types of diamonds; some machines grow very large stones, others very small. The HPHT method is used to grow fancy blue diamonds, whereas CVD produces yellows, pinks, and grays. High pressure, high temperature diamond production is the oldest and most common way lab diamonds are grown. A diamond seed is packed into a growth cell with synthetic carbon (graphite). A diamond press then heats up that growth cell to 1500 degrees C and exerts 1 million psi (90,000 atmospheres) of pressure. As the cell rapidly cools it forms into a rough crystal: our favorite form of carbon, also known as diamond! The Chemical Vapor Distribution method requires placing a diamond seed into a vacuum chamber, adding gasses, and microwaving. This creates a reaction that deposits more and more carbon on the seed, building the diamond up layer by layer. Compared to mined diamonds, Ada's diamonds have fewer impurities and fewer defects in the crystal structure. Our white diamonds are greater than 99.99999% pure carbon. This makes Ada Diamonds whiter, brighter, and stronger than the vast majority of mined diamonds. How much cheaper is a lab diamond? At Ada Diamonds, it’s important to us that our customers get the very best diamond and setting they can for their specific budget. We like to say that your money goes a little bit farther at Ada than a traditional jeweler, but it’s not because growing diamonds is cheap. It's quite the opposite! In fact- De Beers self-reported costs to mine diamonds was $104 per carat (for rough diamonds) in 2015. The marginal cost to grow each diamond in a laboratory is many times the cost for De Beers and other mining operations to dig diamonds out of the earth, even if you ignore the fixed costs of the machinery required to culture diamonds in a lab. The costs to cut, polish, and grade diamonds is exactly the same, regardless of the origin: grown or mined. Laboratory grown diamonds are very expensive to make (orders of magnitude more expensive than to mine). There is no risk of them "flooding the market" and driving down the value of diamonds over the long term, so they are still an excellent investment. In fact, lab diamonds purchased in 2011 would be more expensive to buy today. So how can laboratory grown diamonds be offered for up to 30% lower prices than their mined equivalents? 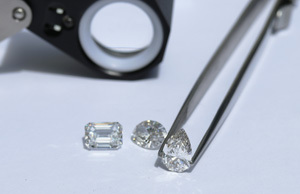 The laboratory grown diamond industry runs on an efficient 21st century supply chain where diamonds are grown, then cut and graded, then sold via qualified retailers around the world. No unnecessary middle men, no added cost passed onto the customer. There is a unique opportunity for exceptional savings with lab grown colored diamonds. Fancy colored cultured diamonds are priced comparable to colorless diamonds (at thousands per carat), making them an incredible alternative to natural fancy colored diamonds which often sell at auction for millions of dollars per carat. Laboratory grown diamonds are simply the future of fine jewelry. They are a paragon of human achievement and represent over 60 years of research and development. And of course they are available without negative externalities. Lab grown diamonds are of known origin, so they are guaranteed to not contribute to conflict in war torn regions around the world. They are sustainably created and use minimal power and electricity compared to mined diamonds. They do no harm to fragile eco systems, wildlife, or transport animals. They are grown by companies in western industrialized nations that pay their workers a fair wage and benefits and maintain safe and comfortable working conditions. Are all lab diamonds flawless and colorless? Since the growth process in the lab is design to closely mimic what happens in the earth’s crust, lab grown diamonds have the same types of inclusions and imperfections that you’ll find in mined diamonds. If the diamond crystal grows too fast, there can be minuscule cracks (feathers) in the diamond. There can also be small inclusions of trace elements or other growth defects that cause the diamond to be near-colorless or slightly included. Lab diamonds are independently graded on the exact same criteria as mined diamonds by the exact same independent gemological laboratories that also grade mined diamonds. Ada Diamonds has relationships with every grower around the world, giving us access to the best of the best in lab grown diamond supply. It's important to note that lab grown diamonds are real diamonds; but more than that, they're the best diamonds on earth. They have the same chemical, physical, and optical properties as mined diamonds; however, every single lab grown diamond receives the highest purity rating available (called type IIa). This is due to an absence of nitrogen impurities and their near perfect crystal structure which is greater than 99.99999% pure carbon. Only 2% of the world's naturally mined diamonds are worthy of that purity rating and are valued more highly as a result (some famous examples include the Cullinan diamond in the Crown Jewels and Kim Kardashian's famous stolen Emerald cut diamond), whereas 100% of all colorless lab grown diamonds are type IIa. Higher purity produces a brighter, whiter, and more sparkly diamond. Can you tell the difference between a lab grown diamond and a natural diamond? A general consumer and local jeweler will be unable to distinguish the difference between a natural and lab grown stone; in fact, because of the type IIa purity assigned to lab grown diamonds, most people will simply remark that it's one of the best diamonds they've ever seen. Third party gemological organizations maintain sophisticated tools that can detect whether a diamond was earth extracted or lab grown. The reason natural diamonds and lab grown diamonds look the same is because they have the same exact same crystal structure, chemical composition, optical properties, and physical properties: carbon atoms arranged in a cubic crystal structure. Ada's diamonds are not fake, simulants, or cheap substitutes. Ada's diamonds are the hardest material on Earth and are approximately 10 times harder than sapphire and 100 times harder than cubic zirconia. It is worth noting that Ada proudly discloses the origin of our stones as laboratory grown. We do not sell mined diamonds, ever, and have gone to great lengths to test and confirm that all of our diamonds used, even small melee, are of known origin. In fact, all of our diamonds above 0.25ct are graded by third party gemological institutions and microscopically laser inscribed with a trackable certificate number so that you always know that your diamond is your diamond. You can rest assured when you buy Ada Diamonds jewelry that all of our diamonds were grown by scientists in clean, safe, and fair working conditions. How long does it take to grow a diamond? It takes about one week to grow a one carat (cut and polished) diamond. Can diamonds be grown from my loved one’s ashes? Ada can process and purify any carbon-containing item-including ashes, flowers, wine corks or other keepsakes, to high-purity carbon that is used to grow personally meaningful diamonds: the ultimate in custom. We call these cultured diamonds "Lavoisier Diamonds" in honor of Antoine-Laurent de Lavoisier, the father of modern chemistry. Among his many 18th-century scientific achievements, he proved that diamonds were made of carbon. Top left: filling a crucible with meaningful keepsakes. Top right: Sealing crucible to send to Ada to be cooked into graphite. Bottom left: Rough diamonds grown from meaningful carbon. Bottom right: Diamond being polished. Flowers, champagne cork, and the program from a customer's wedding day. Browse over 100 collection pieces, or talk to one of our knowledgeable Diamond Concierges and create something from your imagination. You can also browse our Instagram or Facebook page for fresh, up to the minute inspiration. Have more thoughts on lab grown diamonds? Be sure to let us know in the comments section!